September | 2012 | Do You Hear The Music? 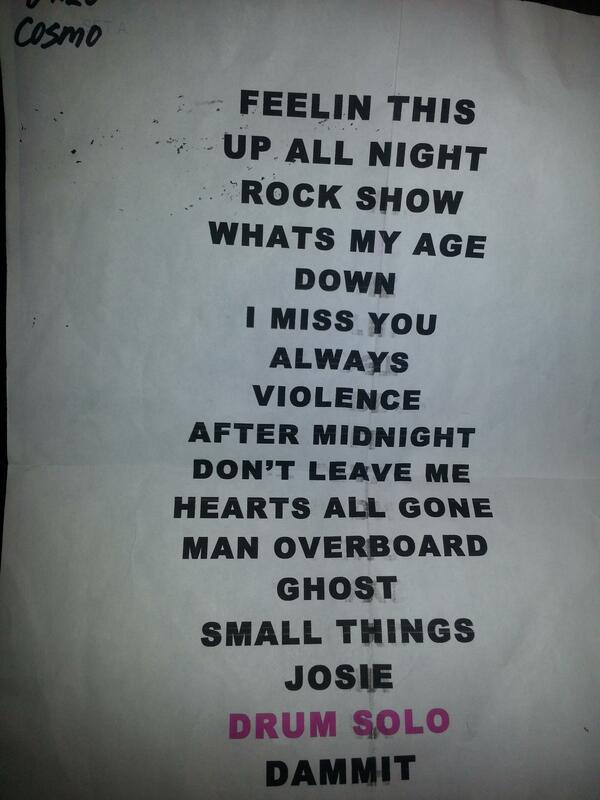 Set list from Blink 182 night one in Vegas. Oh what a show it was last week at Vinyl inside the Hard Rock Hotel. 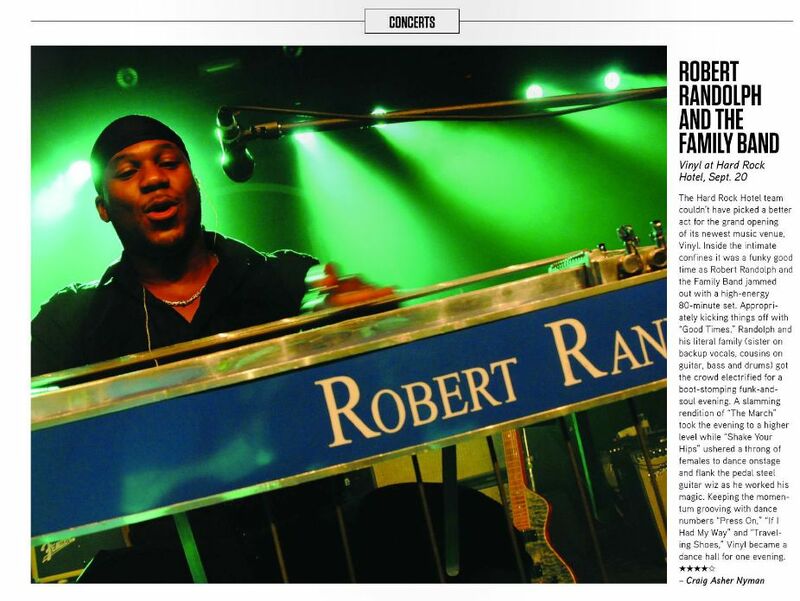 Having seen Robert Randolph perform numerous times, I knew what I was getting into but this show was by far the best I’ve been too, it was flat out awesome. See below or click HERE for my review which appears in the September 27 issue of Vegas SEVEN. What can I say except I’m a huge fan of Grouplove and I have been for some time. Having had the chance to see them perform live several times, I’m excited to see them next week out here in Las Vegas and to make it even more special, I had the opportunity to chat with Christian Zucconi to preview the concert in the new issue of Vegas SEVEN. The issue dropped today and you can click HERE or see below. Hope to see everyone at the show, it’s going to be a great one and Christian promised a jump in the pool following the last song! Wow, Wow, Wow, just heard two sweet new remixes of GROUPLOVE’s “Itching On A Photograph” by Wolf Gang and The Very Best. I loved the song before but wow, these remixes are dope. I’d love to say you can listen and download below but I got it from their mailing list this afternoon so I’d suggest visiting www.grouplovemusic.com, sign up for their updates and perhaps you can get your hands on these remixes too. 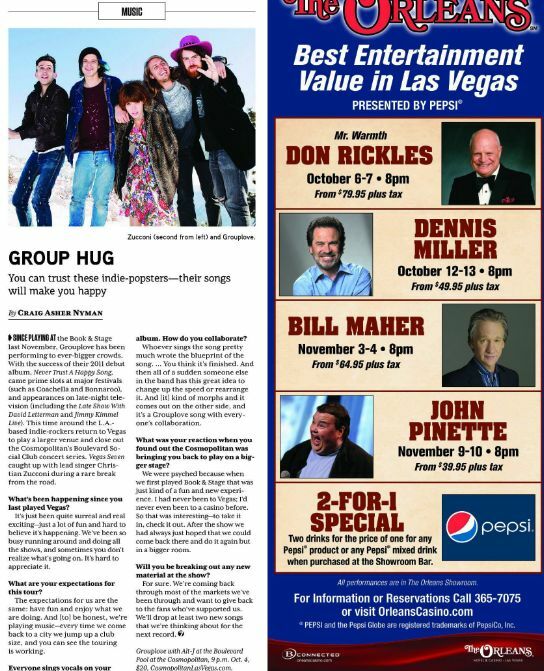 And keeping on the GROUPLOVE topic for a moment, this Thursday my interview with Christian Zucconi runs in Vegas SEVEN so keep your eyes out for that as I preview the upcoming show on October 4 at The Cosmopolitan. A day late I know but what the heck. New Music Tuesday for the second straight week was a powerful one. 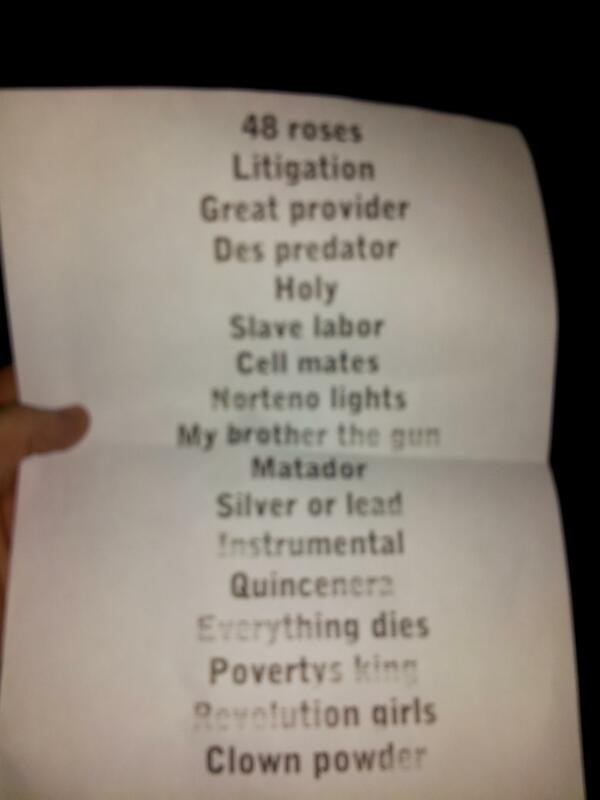 The Killers dropped Battle Born, Ryan Bingham – Tomorrowland, Wiz Khalifa – O.N.I.F.C, Ben Folds Five returned with The Sound Of the Life Of The Mind Out, Dinosaur Jr. – I Bet On Sky, Grizzly Bear – Shields, Martin Solveig – Smash, Ne_yo – R.E.D., Pink – The Truth About Love, Nelly Furtado – The Spirit Indestructible, and many others including Kanye West – Kanye West Presents Good Music Cruel Summer. I’m a fan of The Killers outright so it’s no surprise that I like what I’ve listened to thus far on Battle Born. It’s what I expected and got to love how they always stay true to their home, Las Vegas! Also worth checking out is the short film Werner Herzog made while following the fellas leading up to the release. Ryan Bingham, man what more can I say but this guy is just so damn good. Had the pleasure of seeing him in concert a couple times, interviewing him last year and I just can’t get enough of his music. Tomorrowland is the Ryan Bingham I remember first listening to when I discovered, Roadhouse Sun and then his first album Mescalito. I encourage everyone to give this disc a listen and get ready to rock out. I may as well start my weekend officially on Thursday with the amount of live music in Las Vegas. Tonight it is straight over to The Cosmopolitan to check out The Hives. I’ve been waiting YEARS to see these guys live and finally I get the chance! Plus it’s the anniversary party for Vegas Rated, the magazine that I contribute music stories to. Fiesta Fiesta! While I’m super stoked for The Hives show, I’m beyond excited about Friday night where Mariachi El Bronx, takes to Book & Stage at 10:30 p.m. for an amazing kickoff to Mexican Independence Day Weekend in Las Vegas. If you have never heard of Mariachi El Bronx, trust me when I say you don’t want to miss this show. If you have heard of Mariachi El Bronx but never seen them live, this is a show you don’t want to miss. If you know their story and the original band, The Bronx, you definitely want to see this show. I had the pleasure of finally getting to see them this past June at Bonnaroo and it was easily one of my favorite shows of the festival. I’m expecting this to be the highlight of my weekend. I know, I know I just proclaimed my weekend to be taken over by Mariachi El Bronx but on Saturday my friends Sonny and Chris of Rock n’ Roll Wine host their 7th Wine Amplified event over at Mandalay Bay Beach with music by Young The Giant and Vintage Trouble. Even cooler, my brother will be pouring his Labor Wines at the event! So I’ve got family, two great wines from my brother, my friends events and two bands I love performing – yeah you could say this is going to be a fun evening. And that is why my weekend is starting tonight!